Property Of Zack has unleashed the third installment of their live Wonder Years video series. This time, POZ has posted performances of “It’s Never Sunny In South Philadelphia” and “Hostels And Brothels.” Click here to view the clips. Watch The Wonder Years live video for the song “My Last Semester” off of their latest release, The Upsides. Keep your eyes open today, The Wonder Years are revealing 1/2 of their spring touring plans. Fans of the Wonder Years can watch a behind the scenes video from the set of “Melrose Diner,” after the jump. The reissue of The Wonder Years’ 2010 album, The Upsides, is available now via Hopeless Records. The Wonder Years have released their video for “Melrose Diner.” You can view the clip here. The Upsides reissue is in stores now via Hopeless Records. Just days before their appearance on BAW, The Wonder Years have released the trailer to the upcoming music video for “Melrose Diner.” Check it out after the jump. You can check out a track by track guide for the “The Upsides” re-release on Alt Press. 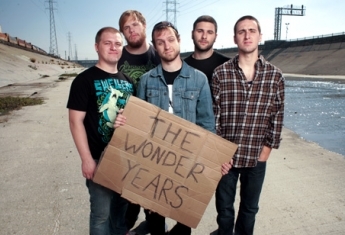 Days before the re-release of The Upsides, The Wonder Years have premiered another bonus track. Check it out after the jump!